"Capturing the Rainbow: Bolivian Textiles from Ancient to Modern Times," by Shelley A. Burian, M.A. Figure 1. Skeins of Andean alpaca wool hang to dry after dyeing. Photo by Ken Bosma, licensed under CC BY 2.0. The contemporary weavers of the Bolivian Andes are internationally famous for their skill and creativity. Furthermore, their art has increasingly become the visual symbol of the vitality of indigenous traditions in South America and the Andes in particular. The features that distinguish the “traditional” from the “modern” vary according to different perceptions of indigenous communities, those from within and those from without. Outsiders tend to restrict the idea of tradition to practices which continue or persist from the pre-Hispanic period or which differ substantially from European culture and aesthetics. Figure 2. A fine example of tradition and change, this child’s poncho is a 19th century garment with the same types of designs seen in pre-Hispanic tunics. On loan to the Michael C. Carlos Museum, L2016.13.1. Photo by Michael McKelvey, 2017. Tourists have embraced weavings featuring natural dyes, ponchos that are hand woven (fig. 2), and knitted hats with long flaps made of costly baby alpaca fiber; these appear to them as closer to the pre-Hispanic Andean culture, more “traditional” than the bright weavings of neon polyester fiber (fig. 3). Few realize that these textiles are, in fact, largely the result of post-Hispanic developments in the production of garments. First, the skills of natural dyeing have been revived relatively recently to supply tourist demand and therefore to provide increased economic benefit to indigenous communities. In fact, the bright clothes fashioned of synthetic fiber or chemically-dyed alpaca or sheep are preferred within indigenous communities themselves; they are viewed as a natural evolution rather than a break from their history or an erosion of the skills which still define many aspects of their lives. Rather than defining Bolivian Andean weaving as “traditional” by its fidelity to the past regarding styles and materials, it is more accurate to definite it as a tradition by its ability to absorb new ideas and evolve while maintaining its practical and symbolic importance in the life of indigenous communities (see Passing the Flame). Figure 3. 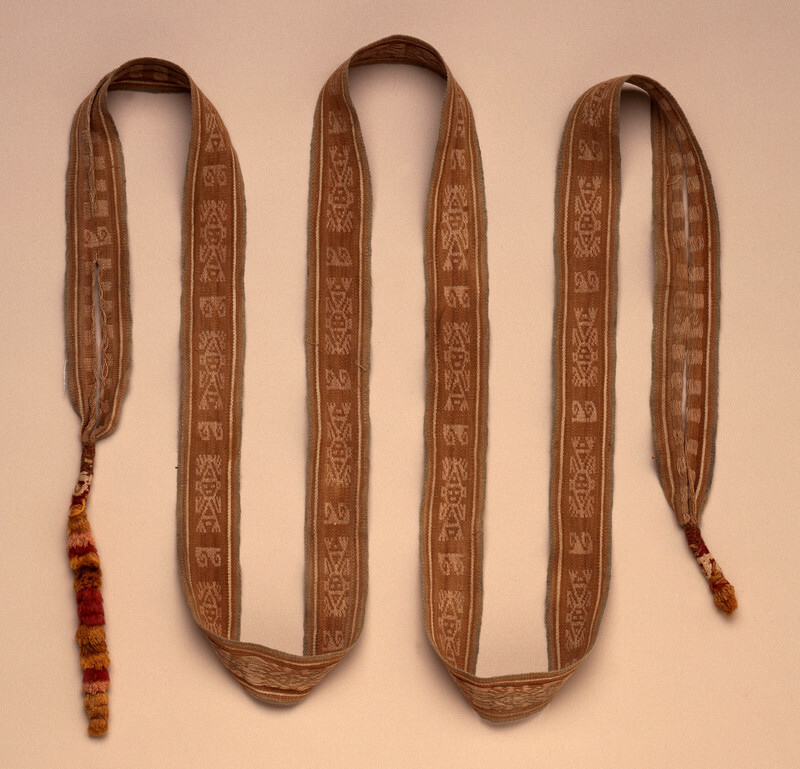 This belt or faja from the Qaqachaka community in Bolivia contains bright aniline-dyed polyester fiber woven in a doublecloth technique, a pre-Hispanic weaving technique revived in the 20th century. Michael C. Carlos Museum, 2016.21.3. Photo by Michael McKelvey, 2017. Despite the introduction of new materials and imagery, the most common technologies used in the local manufacture of garments in the Bolivian Andean highlands have remained virtually unchanged since the pre-Hispanic period, roughly 3,000 BCE-1532 AD (Stone-Miller 1994, 11). The two most common types of looms used to weave today are the four-stake loom and the backstrap loom (figs. 4a,b; Arnold with Espejo Ayka and Maidana Rodriguez 2015, 69). A four-stake loom has four corner sticks driven securely into the ground and two horizontal cross pieces around which the warp is wrapped. 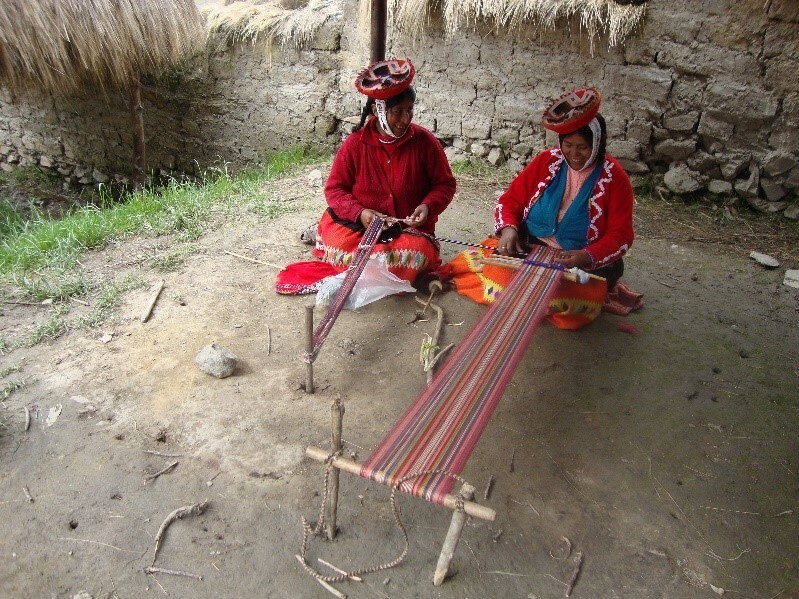 Women pass the ball of warp yarn back and forth to each other (an excellent example is found in the documentary Peruvian Weaving: A Continuous Warp for 5,000 Years, 2007). Figure 4a. 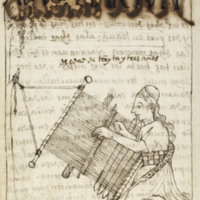 Illustration (Folio 80, 215) from El primer nueva corónica y buen gobierno (The First New Chronicle of Good Government, 1615) by indigenous author Guaman Poma de Ayala showing a 33-year-old weaver weaving cloth on a backstrap loom to make tribute for the Inkas. GKS 2232, 4º. Image courtesy of The Royal Library, Copenhagen. FIgure 4b. 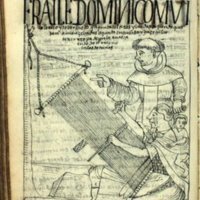 Another illustration from Guaman Poma de Ayala’s manuscript (Folio 257, 645), this image shows a Dominican monk forcing a weaver to produce cloth for the Spanish by pulling on her hair. GKS 2232, 4º Image courtesy of The Royal Library, Copenhagen. The backstrap loom is more mobile than the four-stake; it consists of the same two sturdy horizontal sticks above and below, the upper one tied to a house pole or a tree and the lower one to a belt around the weaver’s waist (fig. 5). The warps span the distance between the loom bars and other tools help the weaver pull up different sets to insert the sideways weft threads (fig. 6; see The Best of the Best). When a section of weaving near the woman’s lap is completed, she rolls it in order to reach the next section. After a session of weaving, she can untie one side of the belt and roll the entire loom up into a cylinder which can be stored or carried without tangling the threads. Some contemporary weavers combine the two types, using stakes to secure the top loom bar of a backstrap to the ground (fig. 5, right). 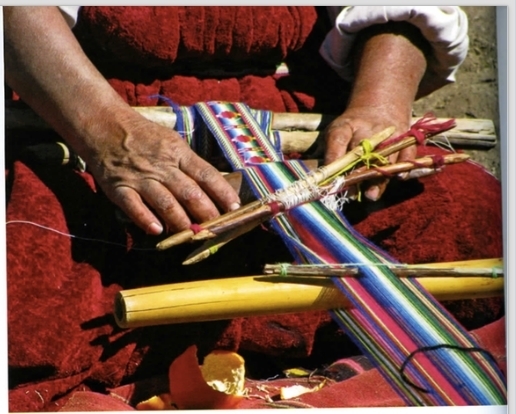 Backstrap looms have been in use for millennia in the Andes. 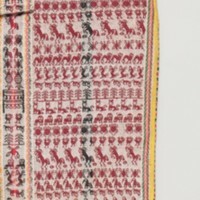 Partially woven textiles dating to the Late Intermediate Period (1000-1450 AD) have been excavated from sites related to the Chancay culture on the South Coast of Perú, such as the loom containing a partially finished band with cat designs (fig. 7b). 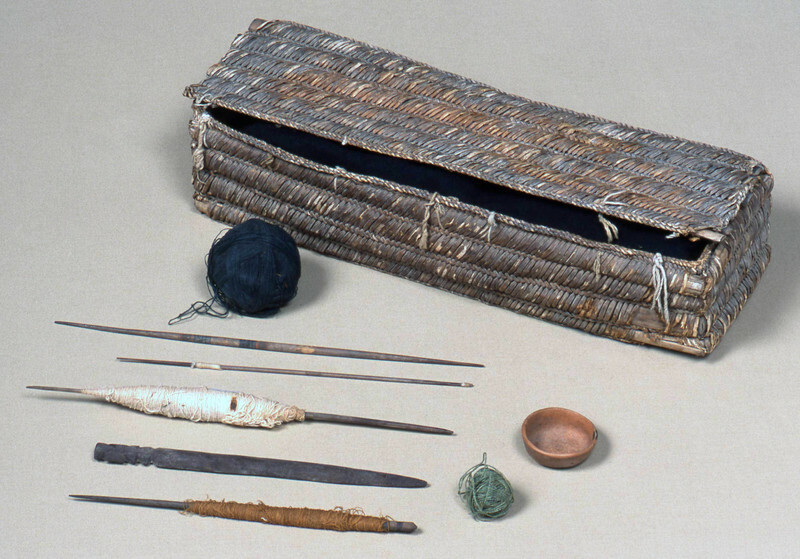 Contemporary versions of other ancient tools used for spinning and weaving, such as those found a typical weaver’s workbasket from the Chancay culture (fig. 8), are still in use today (Arnold with Espejo Ayka and Maidana Rodriguez 2015, 69). Figure 5. Two Quechua women, Felicitas (left) and Mercedes (right), are members of a weaving cooperative run by Awamaki, a small non-profit organization in Patacancha, Perú. Here, Felicitas demonstrates how to weave a belt, while Mercedes weaves a chalina, or scarf, out of yarn made from alpaca wool. Photo courtesy of Lauren Lipuma. Spindle whorls in particular stay generally similar because of their functional nature; they must be roundish, balanced from side to side, and have a central hole to accommodate the spindle (a pointed wooden stick). Ancient whorls such as the one in figure 9 were usually made of clay and may be sculptural or spherical, as opposed to being disc-like. This whorl is unique because it is made in the prestigious and difficult blackware ceramic technique which involves careful smothering of a kiln fire to trap smoke and turn the clay black. 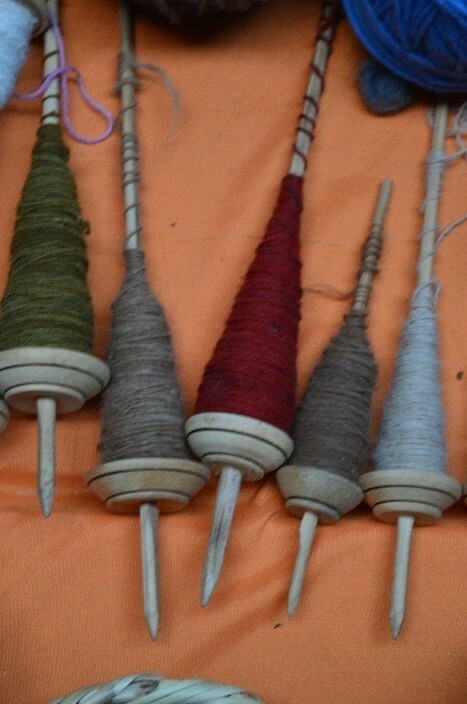 More modern spindles such as these belonging to a weaver working in the outskirts of Cuzco, Perú (fig. 10) are flat rather than spherical and wooden. It is possible that wooden spindle whorls existed as well in ancient times; however, wood does not preserve as well as clay. Wooden ones could easily have been for daily use while ceramic ones were reserved for the production of high-status textiles. Figure 6. A modern Peruvian women weaving on a backstrap loom. Photo courtesy of Andrea Heckman (see Woven Stories: Andean Textiles and Rituals, 2003). Weaving techniques in which the warp threads are visible while the wefts are hidden, called “warp-face,” are the most common in the Bolivian Andes today for making clothing. Warp-face weaving in the Andes dates back to the Chinchorros culture from Northern Chile during the Formative Period, 1800-400 BC (Arnold and Espejo Ayka 2012, 143) (figs. 6, 11, 12). A complex, early (dated between 600-900 AD) example of this is a mortuary belt from the Nasca/Wari style currently in the collection of the Museo Nacional de Etnografía y Folklore of Bolivia (Arnold with Espejo Ayka and Maidana Rodriguez 2015, 114, cat. no. 40). Figure 7a. 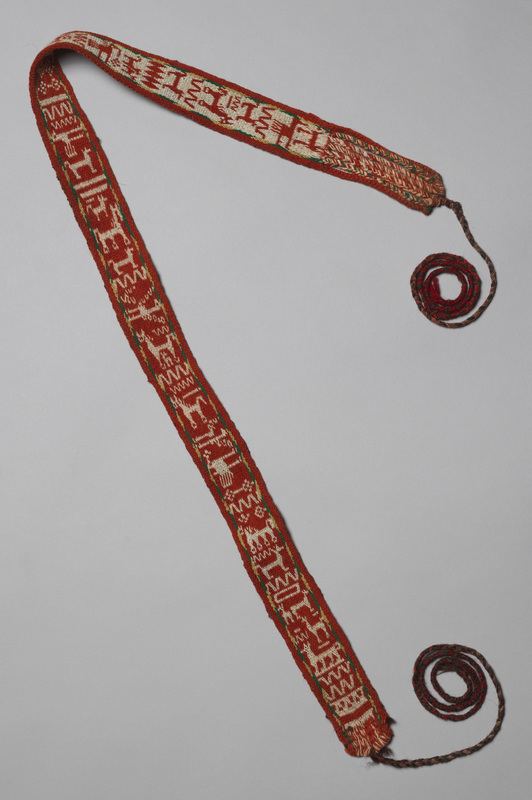 This Chancay backstrap loom dates from1000-1450 AD, including the bottom loom bar. The unwoven warps, which have been spiralled for the photographic purposes, originally would have been straight and taut and attached to an upper loom bar. Michael C. Carlos Museum, 2002.1.58A/D. Photo by Bruce M. White, 2013. Figure 7b. Michael C. Carlos Museum, 2002.1.58A/D. Photo by Bruce M. White, 2013. 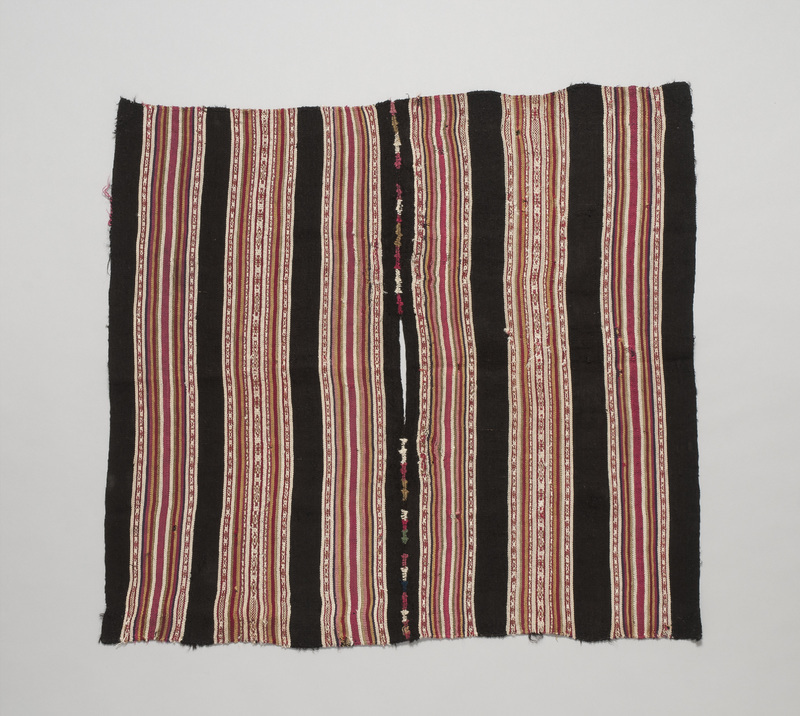 Although there are myriad different ways of weaving warp-face cloth, the technique which predominates the objects in this exhibit, found in very few places outside of the Andes, is that of “chosen warp” known as palla in the Aymara and pallay in the Quechua languages (figs. 6, 11; Arnold and Espejo Ayka 2012,193). Archaeological examples of this technique date to the Middle Horizon (400-1000 AD) and appear in a variety of cultures, including the Wari and the Mojocoya from central Bolivia (ibid., 197). 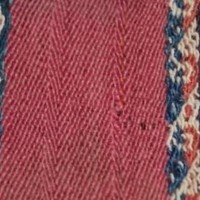 In this technique, a single loop of warp thread is made up of two different colored threads tied together and the opposing colors are systematically moved forward or backward to create a pattern the same shape but in different colors on each side of the cloth, seen in the belt or chumpi from Charazani (fig. 12). In modern times, these warp-faced techniques became extremely complex with up to eight different combinations of colors in the warp threads, but archaeological examples record the use of no more than three colors in ancient times (ibid., 193). 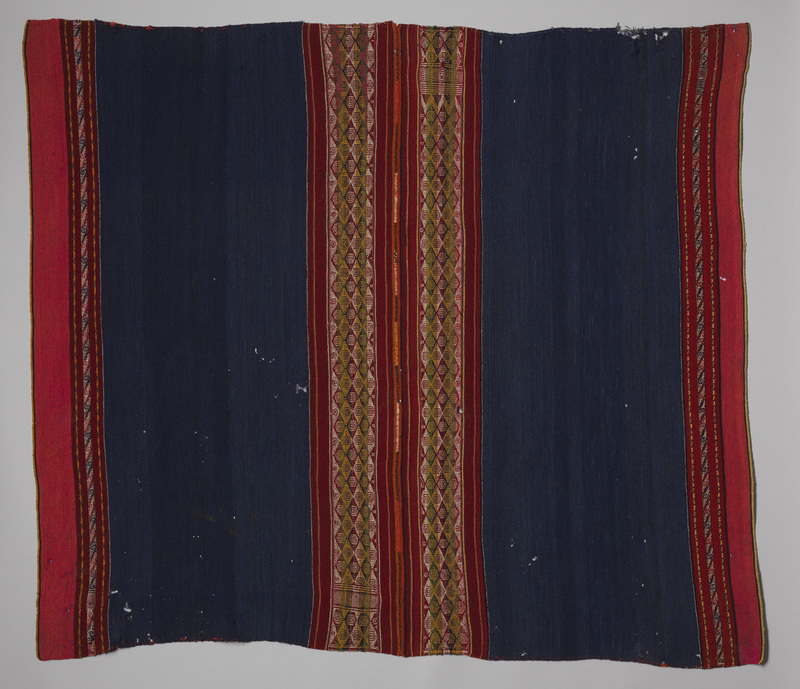 The arrival of the Spanish brought significant changes to the types of clothing Andean people wore and changed some of the ways in which they produced textiles. Many of these changes, as well as the traditions of the Inka imperial period, are beautifully illustrated by indigenous author Guaman Poma de Ayala in his El primer nueva corónica y buen gobierno (The First New Chronicle of Good Government) written in 1615 (figs. 4a, b, 13). Designed as a letter to King Phillip III of Spain, Guaman Poma’s goal was to educate the king on the history of Andean indigenous people. As a Catholic convert, he argued Andeans had already been chosen by God to become Christian before the arrival of the Spanish and thus merited better treatment (Poma de Ayala 1615, 1080). Today, his manuscript and illustrations are an invaluable aide to scholars, providing a visual guide to daily life, shamanic religious customs, and colonial conditions during the 14th and 15th centuries in the lands controlled by the Inka and later by the Spanish. The illustrations feature many clues about the production of Inka and early Colonial textiles (fig. 13). Figure 8. This Chancay workbasket contains small balls of cotton thread in various colors, spindles of various sizes (some still holding finished thread), a clay bowl for support in spinning fine cotton, and a comb composed of sharp sticks wrapped with decorative threads for beating down warps. Michael C. Carlos Museum, 2002.1.126A/U. Photo by Michael McKelvey. The most notable changes took place in the types of clothing men and women were required to wear and manufacture. Under the Inka, men wore knee-length, rectangular, sleeveless tunics, uncus or ccahuas, with a loincloth underneath (fig. 13), and a mantle or cloak called a llacota or a yacolla over it (Phipps 2004, 19-20; Adelson and Tracht 1983, 50). Women wore wrap dresses called an anacu or acsu (fig. 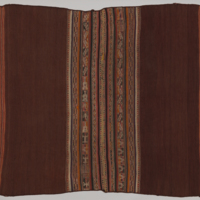 14a) — made up of two long pieces of cloth in the case of the Aymara and three in the case of the Inka — sewn together in the center (Phipps 2004, 20-21). Like men, they also wore mantles, the types and styles varying according to the weaver’s regional and ethnic identity (ibid., 2004, 21; Adelson and Tracht 1983, 78-83, cat. no. 17-20). These mantles were pinned across the breast with decorative pins called tupus or phicchis (fig. 14b). Figure 9. 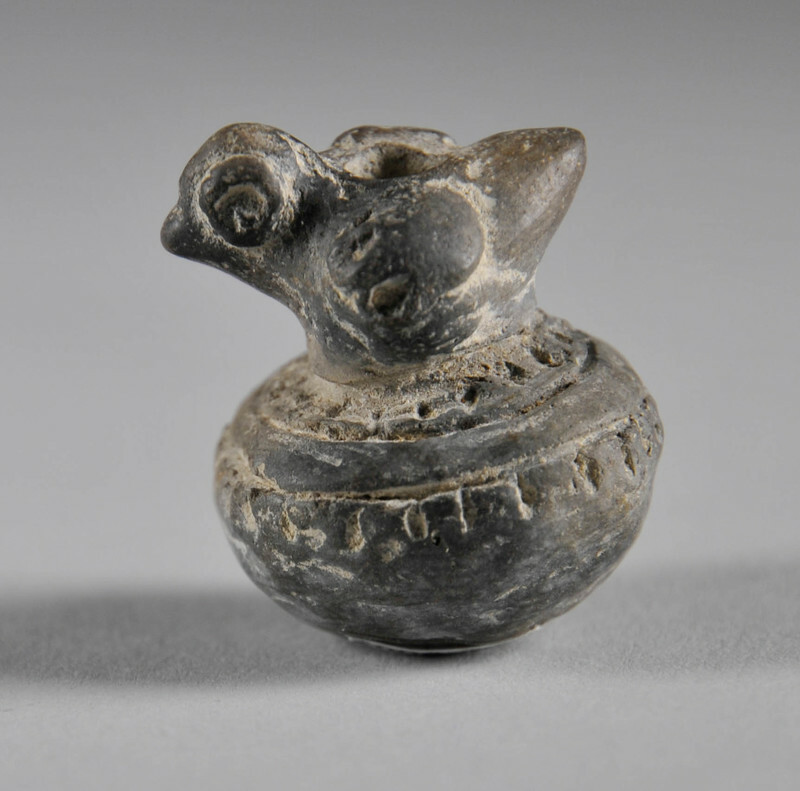 This Chimú-Inka ceramic spindle whorl takes the form of a bird which, along with the use of the prestigious blackware technique, indicates it served ceremonial as well as utilitarian functions. Michael C. Carlos Museum, 2006.5.34. Photo by Stacey Gannon-Wright. The Spanish deemed the exposure of bare legs — lack of pants for men and the looseness of the women’s skirts — immodest (Pillsbury 2002, 78; Phipps 2004, 30). They required men to wear breeches under their uncus and women to either sew up their wrap dresses or wear a special underskirt to obscure their legs (Phipps 2004, 30). Similar requirements were imposed on Maya women in the Captaincy General of Guatemala (see Creations of the Red Goddess, and The Ties that Bind). Figure 10. Modern Andean spindle whorls, used throughout Bolivia and Perú, are made of wood. The thread gathers in a cone above the whorl. Photo courtesy of Shelley Burian. Striking a compromise between conforming to these requirements and maintaining their previous clothing types, indigenous people modified certain existing garments and invented new ones. Men continued to wear uncus, an important symbol of leadership and status, but they were shortened and, in the case of the Aymara, slits were added up the sides (Pillsbury 2002, 78). These modifications made it easier to wear ancient-style tunics over Spanish-style breeches. Women’s dresses were still composed of multiple pieces of fabric, but they were shortened, becoming an apron-like covering which could be worn over the required underskirt (Phipps 2004, 30). While the male tunic was eventually banned, the shortened acsu has remained a staple of dress for indigenous people dwelling in the Peruvian and Bolivian countryside (Arnold 2015, 323). Today, the acsu is one of the most recognizable female indigenous garments. Figure 11. A Chimú-style belt from ca. 1100-1450 AD was made in a warp-face technique much like modern ones (fig. 12). Michael C. Carlos Museum, 1992.15.288. Photo by Michael McKelvey. The most iconic male indigenous garment today, the poncho, was also a colonial innovation. Ponchos were initially developed to facilitate horse riding; the length and side seams of the uncu made sitting on a horse difficult. From its origins in Chile, the poncho was most likely introduced into the Bolivian highlands by Jesuit priests in the late 17th century from their extensive textile workshop or obraje system (Adelson and Tracht 1983, 65) and it became a widespread symbol of male identity after the tunic was banned in 1781. This new law came as a result of the largest indigenous revolt in American colonial history, that of Túpac Amaru II, which took place during the reign of King Charles III (Phipps 2004, 27). Yet, the new hand-woven ponchos retained many of the design features of uncus. For example, a nineteenth-century boy’s mourning poncho (fig. 2) has stripes of geometric designs woven in warp-face alternating with plain monochrome stripes, a common design scheme for uncus dating as far back as the Arica culture from ca. 1000 to 1350 AD (Adelson and Tracht 1983, 51, 65). Figure 12. 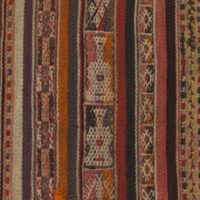 This 20th century chumpi, or belt, from the Charazani Valley region in Bolivia continues the warp-face class of technique seen in ancient textiles such as figure 10. Michael C. Carlos Museum, 2013.25.24. Photo by Bruce M. White, 2014. The poncho was widely adopted by the mestizo class (those with both Spanish and indigenous heritage); mestizos did not wish to be labeled as indigenous through the wearing of the uncu, yet needed to distinguish themselves from the Spanish (ibid.). A specific type of poncho, called the balandrán, was popular with mestizo men. Balandrán style ponchos are composed of strips of cloth woven on newly arrived treadle looms combined with pieces of handwoven cloth. Its popularity was due to the fact that the intricate patterns of the treadle-loom cloth pieces mimicked more expensive cloth imported from Europe (ibid., 64-65). Both the treadle-loom and handwoven cloth components were also often made with a mixture of high-quality merino sheep wool (fig. 16) and camelid fiber (see The Best of the Best), combining European and Andean materials (Arnold with Espejo Ayka and Maidana Rodriguez 2015, 250, cat. no. 103). Inka restrictions on clothing styles were lifted with the coming of the new Spanish overlords. A key part of the Inka’s strategy of control in their vast empire (called Tawantinsuyu) had been dictating that their subjects’ dress remain as it was before, and entirely distinctive from the imperial garments that marked Inka authority (Stone 2007). Since subjects were prohibited from altering their age-old designs, artistic growth was effectively stifled in the 15th and early 16th century Andes. Spanish colonial conditions not only changed the rules, but arguably allowed more freedom of dress, beginning around 1534. Figure 13. 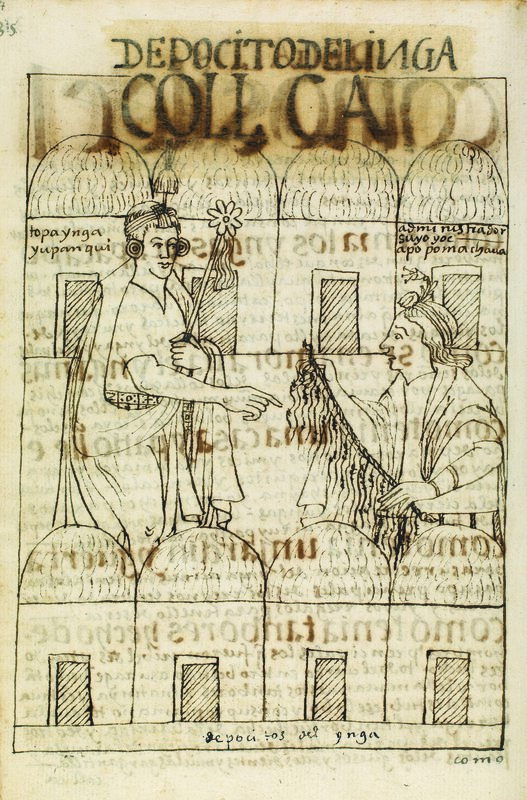 This illustration by Guaman Poma de Ayala shows Topa Inka Yupanque inspecting the knotted string writing devices that record the contents of the ruler’s warehouses. The Inka’s uncu, or tunic, is distinguished by its geometric designs; his yacolla, or mantle, is wrapped around his body. GKS 2232, 4º. Image courtesy of The Royal Library, Copenhagen. 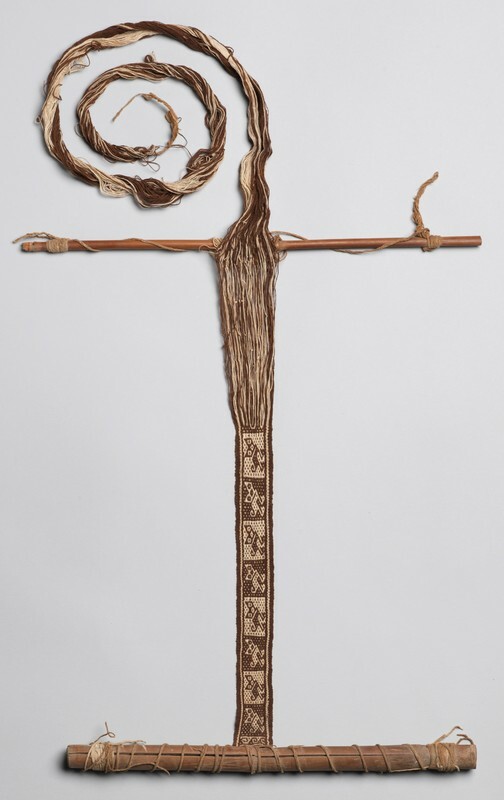 This changeover resulted in a “renaissance” of weaving traditions in communities previously under Inka control; indeed, post-Hispanic changes to society provided new sources of inspiration for weavers. 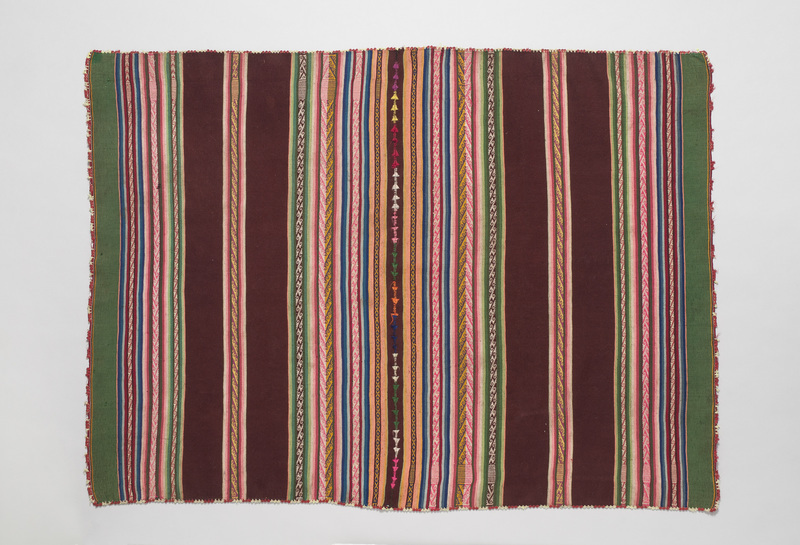 A notable example of this new creative impetus are textiles of the Aymara community woven during the 17th to the 19th centuries. These garments display several innovations in technique intended to create subtle color effects which may have been inspired by silk and satin fabrics newly imported from Europe and Asia. 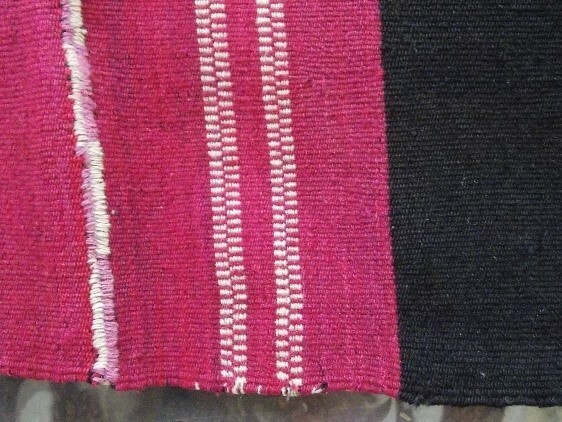 Weavers spun two contrasting colors together (most commonly pink and brown), in a technique called ch’imi (Arnold and Espejo Ayka 2012, 146). The resulting effect is that of a largely monochrome textile dominated by the darker color with contrasting highlights (figs. 17a, b). Another technique, called lloque, utilizes the direction different threads were twisted together (plied) to create a textured effect across the textile’s surface (ibid.). Groups or individual threads alternately plied in clockwise (S) and counter-clockwise (Z) directions are positioned in various sections of mens’ and womens’ mantles, as well as tunics, to give the effect of chevrons or arrows (fig. 17c). In many cases, the play of light across the surface make the chevrons seem to be slightly different colors without any actual differences in dyes. Figure 14a. 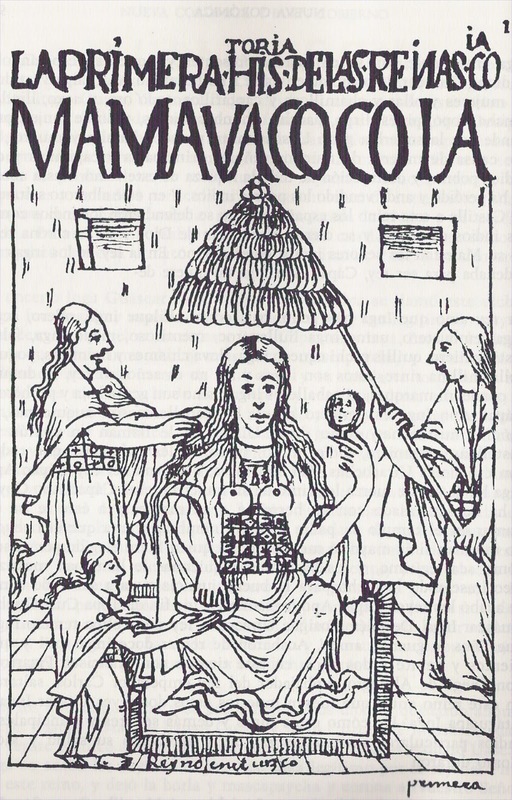 This illustration from Guaman Poma’s manuscript depicts the first Inka queen qoya (queen) Mama Ocllo. The qoya’s wrapped acsu (dress) is distinguishable by the band of colorful designs and her shoulder lliklla (mantle) is draped and fastened with two elaborate tupu pins shaped like flat spoons. GKS 2232, 4º. Image courtesy of The Royal Library, Copenhagen. Figure 14b. 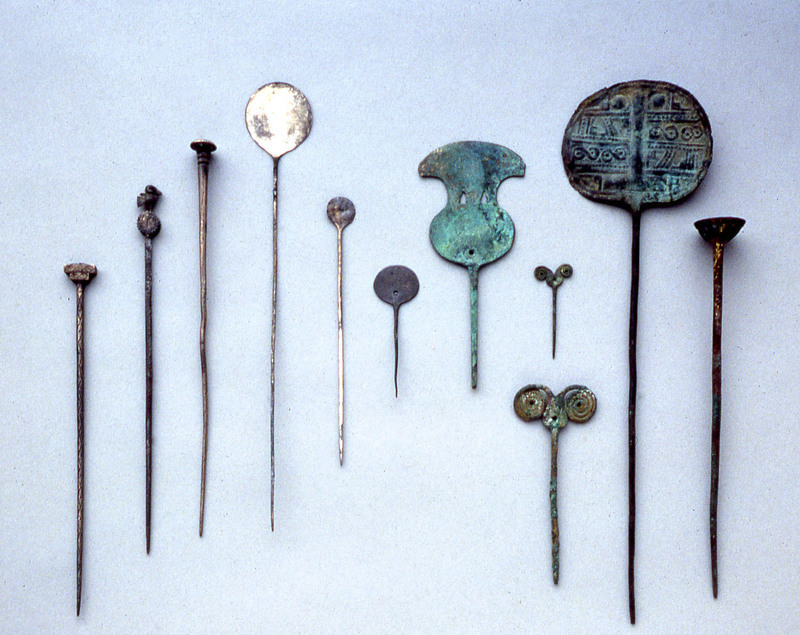 Tupus were pins with large circular or semicircular used to fasten womens’ awayos or llikllas in the front. Single pins oriented horizontally are seen in the queen’s attendants, whereas a pair of oversized vertically oriented tupus is worn by the qoya. Michael C. Carlos Museum collection. Photo by Michael McKelvey. In the post-Conquest period, the remaining Inka descendants and their former subjects were eager to support their claims of power and social status by wearing garments containing materials viewed as luxurious by the Spanish (Phipps 2010, 4-5). Threads made of precious metals and silk were the most prestigious. Metallic thread, usually composed of strips of silver wire wrapped around a silk or cotton core, was imported from Spain (ibid., 27). It is unknown whether metallic thread was ever produced locally, but it is unlikely since wire production was an unfamiliar technology for the Andeans at the time. Silk was imported as both thread and finished fabric. Silk thread was dyed locally and, in some cases, fabrics dyed in exotic Asian dyes were unraveled so that the silk could be re-used in weaving (ibid.). Surviving garments containing metallic threads and silk are not common, and the Carlos Museum is not fortunate enough to possess an Andean one (however, silk is used in a Maya tzut). Although these new foreign materials were indicators of social status introduced by Europeans, Aymara weavers incorporated them into their own value system; for instance, silk was sometimes used as a support thread, called a heading cord, for the ends of a mantle. A heading cord enables a textile to be woven without needing to cut the finished cloth off the loom; the heading cord is tied to the frame and the warp is wrapped around the cord rather than around the loom frame itself. Heading cords are covered by the warps and therefore are practically invisible. 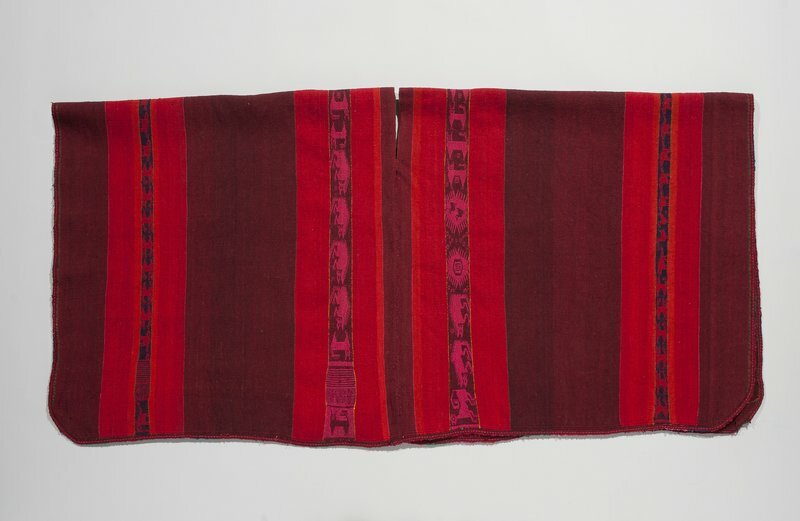 The inclusion of a high-status material in the invisible sections of a garment rather than prominently displayed is a uniquely Andean way of demonstrating status to a textile-literate audience to whom the process of weaving was as important as the product (Stone-Miller 1994, 20). This idea, still expressed in the Quechua language (spoken in Perú and parts of Bolivia) is known as ukhu or “the hidden revealed” (see Dialogues in Thread). The silk is mostly hidden, but its sheen and color may be perceptible; only a person familiar with the process of weaving the garment would know where to look. Metallic thread was also used for warp in chosen warp designs, despite the fact that it is ill suited for the strong structural warp threads due to its brittle nature and lack of flexibility (Phipps 2010, 5, 7). Figure 15. This 20th century man’s poncho is much more colorful than the 19th century example seen in figure 1. Michael C. Carlos Museum, 2013.25.10. Photo by Bruce M. White, 2016. The 19th century brought additional changes to the types of materials used in textile production. Sheep, especially Merino (fig. 16), had been introduced by Spanish colonists during the Colonial period; however, the use of their wool was initially limited to the utilitarian cloth called bayeta, which could be produced with the new Spanish-style treadle looms (Adelson and Tracht 1983, 38). By the late 19th century, sheep wool had superseded the fiber of the native camelids (llamas, alpacas, vicuñas, and guanacos; see The Best of the Best) in weaving ceremonial ch’uspas (coca bags), acsus, llikllas (mantles), and kapotes (ponchos) (ibid.). Figure 16. 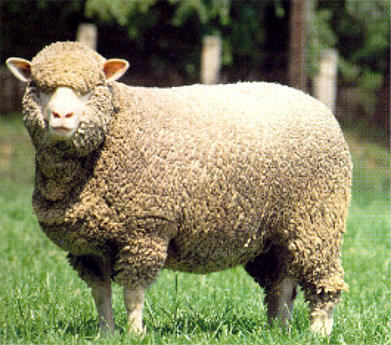 Merino sheep were first bred in Spain and are still prized today for their soft, high-quality wool. Photo by “beanan,” licensed under public domain. Prior to the end of the 19th century, all the dyes used in indigenous Andean communities were natural, the most prestigious colors being the reds of cochineal and the blues of indigo (for a description of indigo see The Best of the Best). The process of dyeing fiber with natural dyes is complex, requiring many different steps and additives such as acidic fruits, tree roots, and minerals to achieve the desired results (Phipps 2010, ix). However, in 1856, aniline or chemical dyes were accidentally invented in England by William Henry Perkin (Robinson, 1969). The difference in color saturation between natural and aniline dyes can be seen by comparing figure 2 with figures 3 and 18. As the result of these new dyes’ growing popularity, availability, and ease of use, they were gradually introduced to Bolivia towards the end of the 19th century and became the primary means of dyeing fiber. In addition to the indigenous love for bright colors, however produced, the extensive trade routes necessary to obtain all the ingredients for natural dyeing had been disrupted in many locations through the Colonial and Republican periods (Adelson and Tracht 1983, 38-39). In addition, aniline dyes color sheep wool very effectively, which further encouraged their use (Zorn 2004, 59). Figure 17a. 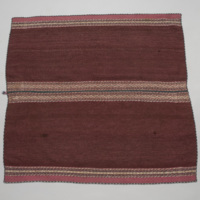 This lliklla from the Bolivar region in Bolivia is a fine example of how the new techniques of ch’imi (b) and lloque (c) were worked into older garment types. On loan to the Michael C. Carlos Museum, L2014.11.3. Photo by Michael McKelvey, 2017. Figure 17b. A detail of ch'imi on a Bolivar region lliklla. On loan to the Michael C. Carlos Museum, L2014.11.3. Photo by Michael McKelvey, 2017. Figure 17c.. This detail shows the lloque technique on a Bolivar region llliklla. On loan to the Michael C. Carlos Museum, L2014.11.3. Photo by Michael McKelvey, 2017. Polyester yarn was spread throughout Perú and Bolivia during the 20th century, resulting in the brightly colored garments favored by the local people today (figs. 3, 18) (ibid. 66, 95). Pre-spun and dyed, synthetic thread offers an opportunity for women who hold other jobs to continue to weave by cutting down the time required to spin and dye thread (Zorn 1998, 165, 177). These bright aniline colors were identified by weavers during the late 20th century in parts of Bolivia as the source of inspiration for a stripe arrangement called k’isa (Arnold and Espejo Ayka 2012, 253). This involves placing different shades of the same hue in adjacent warp stripes. When repeated with several colors within the same textile, k’isa creates a striking rainbow effect (ibid., 256) (figs. 18a,b). 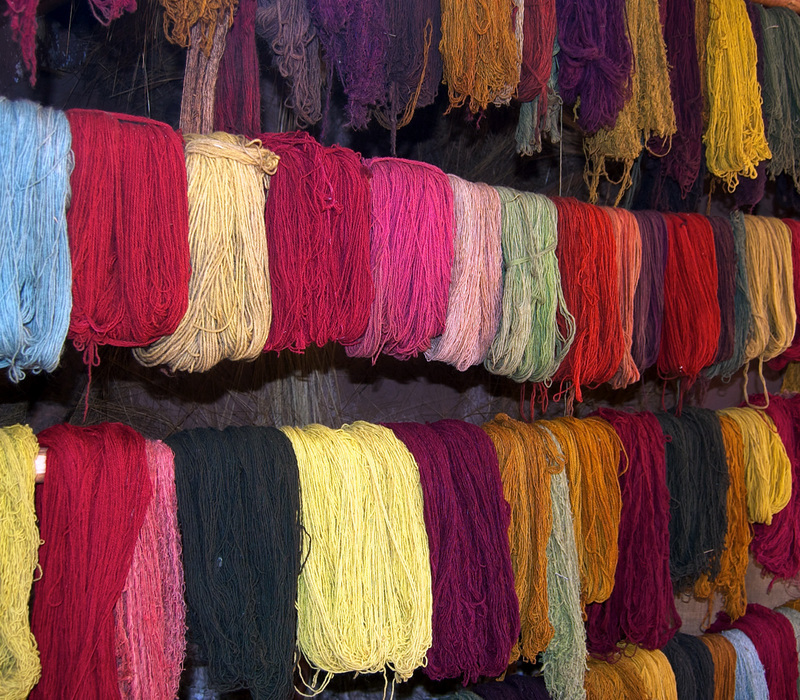 Use of factory-spun yarn in a wide range of colors also indicates a weaver’s increased financial means because it is more expensive than sheep’s wool. By the 1980’s, in the case of the Sakaka community in the Northern Potosí region of Bolivia (fig. 19), using homespun sheep’s wool had become synonymous with poverty rather than with tradition (Zorn 1998, 182) (See Passing the Flame). The images woven by Andean women in their textiles had been gradually changing since the Colonial period. Twentieth-century textiles display an incredibly diverse repertoire, including guitars (figs. 20a, b) birds, spiders, monkeys, men and women, corn plants, llamas, and horses (fig. 21). Guitars were introduced by the Spanish but are now associated with Latin American music. The lute had had a long history in Europe, and then, in 15th-century Spain the vihuela was developed, the “mother” of the modern guitar. In the 16th century the large body of the lute and the shape of the vihuela were merged into the instrument we know today. Perhaps most symbolic of the way changes to other aspects of life were represented in textiles is the inclusion of horses alongside native camelids (fig. 22). Horses had evolved in the Americas during the Pliocene Epoch, approximately five million years ago, but ultimately did not survive (Arms 2008, 24). The horse was re-introduced into the Americas as early as the second voyage of Christopher Columbus in 1493 when he received approval to bring twenty-five horses to Hispaniola, including mares with which to start a breeding program (ibid., 65). The area known today as Bolivia became the center for horse breeding after 1532, when the practice officially began in former Inka territories. By 1553, there were at least three thousand horses in the Viceroyalty of Peru (ibid., 110). Horses were a sign of wealth and prestige, prized for their advantage as a mode of transportation since indigenous camelids cannot support a human’s weight (deFrance 2003, 107). Horses are often shown in a rearing position as seen in a ceremonial chuspa (fig. 21). In a belt (fig. 22) the horses are distinguishable by their hooves, represented by circles as opposed to camelids whose feet were represented by horizontal lines, and their manes, which camelids lack. Figure 18a. 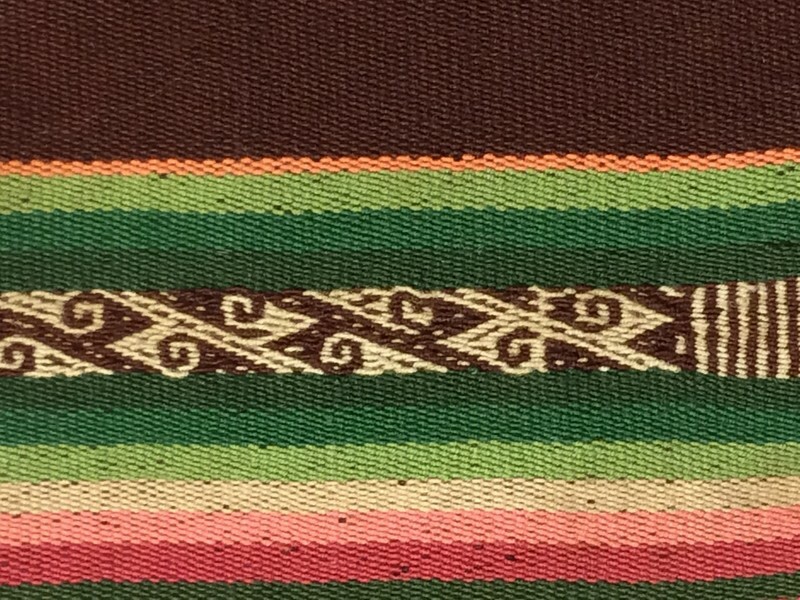 This lliklla (likely woven in the 1970s or 1980s) exemplifies how the introduction of polyester fiber and chemical dyes has led to new color combinations but not the reduction of weaving skill. On loan to the Michael C. Carlos Museum, L2016.14.1. Photo by Michael McKelvey, 2017. Figure 18b. This detail shows k’isa, a recent innovation involving placing different shades of the same hue in adjacent stripes. On loan to the Michael C. Carlos Museum, L2016.14.1. Photo by Michael McKelvey, 2017. Throughout all these changes, the production of textiles continue to be the bedrock of indigenous communities. Anthropologist Denise Arnold and Bolivian weaver Elvira Espejo argue that the process of textile production structures relationships within a community and orders life itself (Arnold with Espejo Ayka and Maidana Rodriguez 2015, 17). The best example of this is the process of learning to produce a textile, effectually an apprenticeship structured by gender and age, a practice which dates from before the time of the Inka. The steps of this apprenticeship during the time of the Inka were originally illustrated by Guaman Poma as part of his attempt to demonstrate key features of the Inka Empire (Arnold and Espejo Ayka 2012). 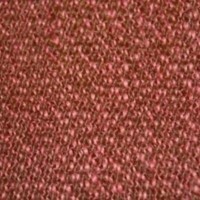 Although in learning to weave today variations occur within different families and regions, there are three basic stages, which are subdivided further into smaller stages according to the type of textile being woven. After learning to spin, girls ages five to eight enter the first stage, in which they learn to make different types of braids (trencillas), which are often seen on the borders of women’s mantles (ibid. ; see the edge of the lliklla in fig. 17c). In order to make the braids, they learn the basic plain or tabby weave (see Dialogues in Thread) along with the basic forms of warp-face techniques. Figure 19. 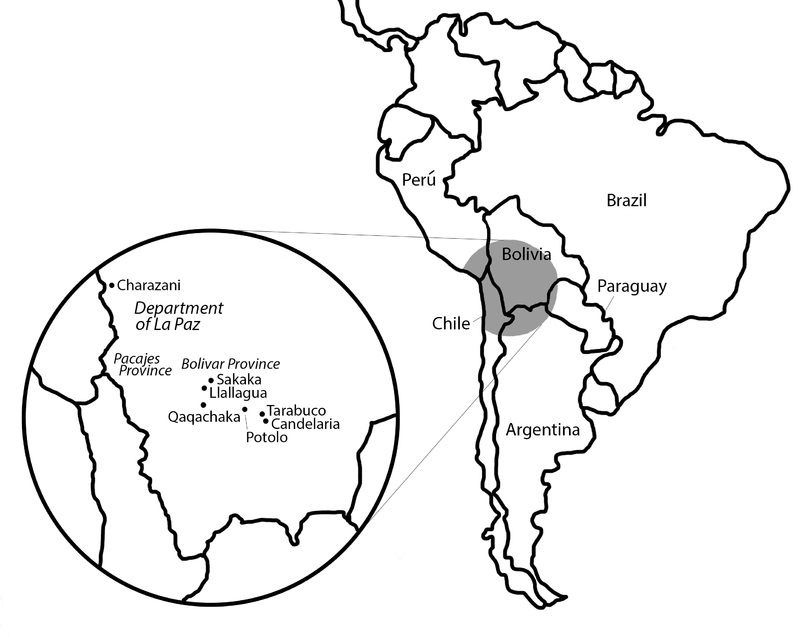 Map of Bolivia. Drawing by Georgia Clark. In the second phase, girls aged twelve to fifteen graduate to weaving belts with variations of the peinecillo or ladder technique (fig. 23). These require the weave to move between warps of two different colors to create either an alternation of colors between rows or within the same row (Ibid, 27, 155-156). This prepares the girls for the more complicated chosen warp techniques used in larger garments. In the third stage, young women ages fifteen to nineteen learn to weave the large mantle called an ahuayo in Aymara and lliklla in Quechua (figs. 18, 19a,b 24). This more complicated garment requires mastery of the chosen-warp technique in all its forms (ibid., 28). Figure 20a. This lliklla from the Llallagua community in the Norte Potosí region of Bolivia contains several renditions of a guitar (b). Michael C. Carlos Museum, 2009.43.2. Photo by Bruce M. White, 2014. Figure 20b. Guitar detail of Michael C. Carlos Museum, 2009.43.2. Photo by Bruce M. White, 2014. Textile production and the finished products themselves govern complex sets of relationships, referred to as the social life of the textile, actively articulating a person’s place within the community as well as special ceremonies and occasions (Arnold and Espejo Ayka 2012, 5; Arnold with Espejo Ayka and Maidana Rodriguez 2015, 17). This is especially true of the rites of passage that mark key milestones in a person’s life. Of particular interest is the ceremony in which a child is given the right to wear the distinct colors associated with their extended family, the rite called chululu in Quechua and chulultaniyaña in Aymara (Arnold and Espejo Ayka 2013, 320-322). The children are decorated first with undyed camelid thread and then with tassels of up to all the twelve colors of the rainbow, viewed as nascent in the undyed thread (ibid.). Among the Qaqachaka community, this rite dictates the colors the children will be able to work with throughout their life, whether as a dyer, spinner, or weaver. The status of the child’s family within the community dictates how many colors will be bestowed on the child during the ceremony: lower-status families are only able to give three or four, while those of higher status can give between seven and the full twelve. Figure 21a. 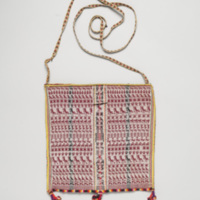 This colorful ch’uspa (coca bag) from the Tarabuco community in the province of Yamparáez, Bolivia contains many modern motifs woven in colorfully aniline-dyed sheep wool. On loan to the Michael C. Carlos Museum, L2014.16.2. Photo by Michael McKelvey, 2017. Figure 21b. A detail of a colorful ch’uspa (coca bag). On loan to the Michael C. Carlos Museum, L2014.16.2. Photo by Michael McKelvey, 2017. According to contemporary indigenous people, weaving in the Andes is in a sense three dimensional: two forces, the movement of the tools and the weaver’s body, create an object which Andean people consider to be a physical extension of this relationship (Espejo Ayka 2015, 10). Andean weavers today classify different types of patterns not by their finished appearance, but by the way the warps are placed on the loom because it is this step that determines the range of options available to the weaver in the actual weaving process (Arnold and Espejo Ayka 2012, 7). Arnold and Espejo have demonstrated that all patterns — from those dating to the pre-Hispanic period such as doublecloth (see Dialogues in Thread) to the complex variations of chosen warp techniques only developed in the 20th century — can be linked together through the arrangement of their visible or invisible warp threads (ibid.). Figure 22. This 20th century chumpi (belt) with horse and llama motifs comes from the Charazani region in the Province of Bautista Saavedra, Bolivia (fig. 19). Michael C. Carlos Museum, 2013.25.27. Photo by Bruce M. White, 2016. In sum, it is still important to question to what extent contemporary Andean weaving remains “traditional.” In this essay, I have argued that tradition should be defined by the ability of weaving to bind together communities. Using that definition, in many regions of Bolivia the Andean weaving tradition has continued virtually unbroken since the pre-Hispanic period. The changes over time discussed in this essay have been transformed into traditions by their adoption into the pre-existing cultural and technical frameworks. New materials have taken on older symbolism, new techniques become a different means of expressing ancient values, and new types of clothing continue to indicate a person’s identity and social status in the same way as centuries-old styles. Figure 23. The peinecillo technique takes the form of two stripes composed of pairs of alternating pink and white horizontal bars in this 20th century revival of a 19th century iscayo (women’s shoulder mantle). On loan to the Michael C. Carlos Museum, L2016.14.3. Photo by Shelley Burian. Figure 24. This 20th century lliklla contains a combination of old and modern textile production techniques. The wide blue sections are dyed with indigo, while the other colors are aniline. The chosen warp technique in the center section is an extremely complex version invented in the 20th century. Michael C. Carlos Museum, 1989.12.3. Photo by Bruce M. White, 2016.